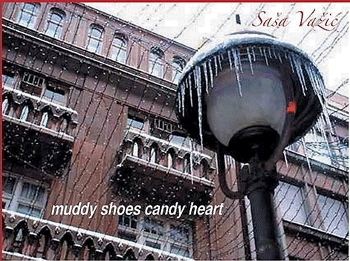 Saša Važić （ササ・ヴァジック）in Serbia is a freelance journalist, astrologer, translator, writer of prose and poetry, essays, book reviews. Važić kindly contributed her haiku to International Haiku New Year’s Festival 2011 by Akita International Haiku Network. Važić’s haiku have been included in over ten national and international haiku anthologies and in a number of national and international haiku magazines. They have been translated into English, Japanese, Chinese, Macedonian, Slovenian, Croatian, German, Czech, Bulgarian, Russian, Polish, Dutch, Norwegian, French, Italian, Hungarian, Romanian and Greek. Važić is the recipient of a number of awards and commendations in contests held in her country, in Japan (Water, Lake and Sea; Suruga Baika; Basho Festival; Ito en; Mainichi), Germany, Croatia, Bulgaria, Canada, the USA, France and Romania. Largely, through her translation efforts she has brought English language haiku poetry, articles and books to Balkan readers and vice versa, Važić is the editor (as well as translator and webmaster) of the bilingual Haiku Reality (http://haikureality.webs.com/indexeng.htm) she started in 2004. She is the author of an e-book of haiku poetry entitled muddy shoes candy heart, edited by Anita Virgil and published by Peaks Press, USA (avirgil2@verizon.net). She has translated 25 books of haiku poetry by Serbian and some foreign authors (into English), as well as David G Lanoue’s novels Haiku Guy and Laughing Buddha into Serbian. Apart from haiku, Važić also writes tanka, haibun and collaborative rengay. She also creates haiga, some of which have been published at the World Haiku Association’s website, Kuniharu Shimizu’s website See Haiga Here, Haiku Canada Review, as well as in the Contemporary Haibun published by the Red Moon Press, USA. Her many longer poems and short stories as well as literary articles and book reviews have also been published in a number of journals, in her country and abroad. The idea to create the HAIKU REALITY has been gradually maturing with my better and deeper acquaintance with the haiku world, the world of poetry and those who create it. Finding beauty and secret in it as well as inefficient efforts of those who whole-heartedly want to belong to it, it appears to me both useful and nice to emphasize the beauty and to point to the inefficient in one place through word of all those who want to and can convey it. Hoping that the HAIKU REALITY will grow into a wonderful garden through which everybody would like to take a walk, relax, be inspired by colors and scents and find his or her own flower, all haiku authors are invited to come, see it, and give it their own gift. All contributions which satisfy the criteria of instructiveness, originality and aesthetic appeal will find their place in the garden of the HAIKU REALITY. You are welcome to send your contributions to vazicsasa@gmail.com stating the subject (Essays, Criticisms, Analyses…; Book Reviews; Haiku Gallery; Haiku), personal data and a photograph (with your contributions for Essays, Criticisms, Analyses…) and a scanned book front page (Book Reviews). Send up to six unpublished haiku. All other works can be either published or not. If already published, please state the place and date of first publication. If your work already exists in English and Serbian (or Croatian) please send in both languages. Comments and suggestions can be sent to the same address. Your contributions are always welcome, and the HAIKU REALITY will be supplemented depending on the number of works received and their quality. I sincerely hope that you will have a good time in Saša Važić’s Haiku World, staying and absorbed in the beauties and wonders of her poetry world. The next posting ‘Haiku by Students at High School (角館高校) in Akita, Northern Japan (Part 1) ‘ appears on March 12. I am sorry that this article was not posted in the website on March 12, for we had the Great East Japan Earthquake on March 11. It will appear when a series of ‘Haiku about the Great East Japan Earthquake’ , which begins on April 30, have finished. strawberry fields . . .
…her lips faintly curves in smile…sad eyes between the pages…I will never read again. These lines made the Haibun “Beyond” an immortal piece.Indeed the words painted the poetry of love and separation.Many thanks Ms SaSa for the poetic excellence.